BUNNAM, Chaleomsak; RINTHAISONG, Idsaratt; SONGSOM, Anuwat. 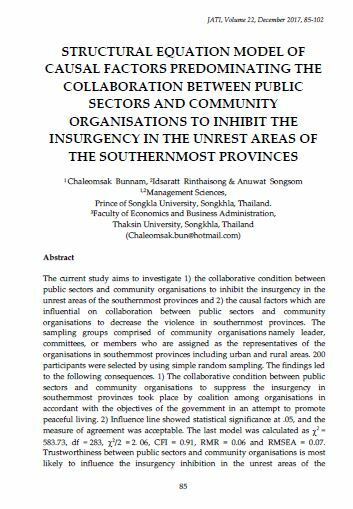 STRUCTURAL EQUATION MODEL OF CAUSAL FACTORS PREDOMINATING THE COLLABORATION BETWEEN PUBLIC SECTORS AND COMMUNITY ORGANISATIONS TO INHIBIT THE INSURGENCY IN THE UNREST AREAS OF THE SOUTHERNMOST PROVINCES. JATI - JOURNAL OF SOUTHEAST ASIAN STUDIES, [S.l. ], v. 22, n. 1, p. 85-102, dec. 2017. ISSN 2600-8653. Available at: <https://jati.um.edu.my/article/view/10248>. Date accessed: 26 apr. 2019. doi: https://doi.org/10.22452/jati.vol22no1.7.